The official*Japanese Bumblebee Movie Twitter*has uploaded the third promotional*Bumblebee Anime Clip. 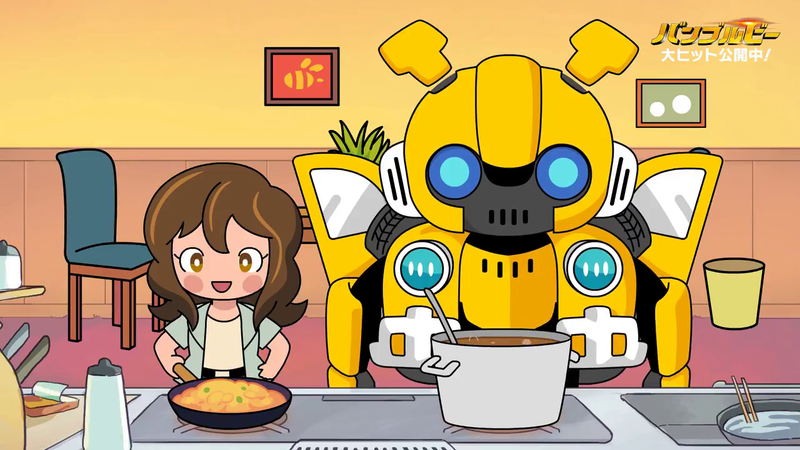 This seems to be the final part of the “chibi-style story” featuring Charlie and her dog Conan together with Bumblebee. This time, Bee learns how to cook, and he seems to break something more than eggs in the process. Troubles, an angry dog, military and some action on this hilarious clip. We are sure your will enjoy this video, even if it’s only in Japanese. We also have posted part 1 and part 2. Check the new video below and some screencaps after the jump! Then &#187; Continue Reading. The post Transformers: Bumblebee Movie – Japanese Bumblebee Anime Clip Part 3 appeared first on Transformer World 2005 - TFW2005.COM.